Instead of cracking open your PC to add extra memory, how about plugging it into a docking station that also gives you a faster processor so you can run more demanding applications? Once PCs switch over to internal optical connections based on silicon photonics instead of the copper wires that run around today's motherboards, "we'll have a new way to design that gets rid of the distance limit," says Sean Koehl, a technology evangelist in Intel Labs. "You can move the memory. Take a very mobile device like a netbook and imagine a docking station that also gives it a connection to faster processing and more memory." That could help with cooling; your notebook could get more powerful without getting hotter. Memory on your PC is going to get faster as well, he says. "Memory bandwidth is very important and we're working on 3D stacking; the signals are going a shorter distance, the circuits they're driving are much simpler and we get a clean signal compared to the noisy, distorted signal we have to deal with when we're making the connection across the motherboard today." Koehl also expects stacking one memory call on top of another to need less power as well as improving the connections between memory chips. Put it all together, suggests Koehl, and you get memory that's ten times more efficient than today's DRAMs. Koehl spends his time thinking about what PCs will do in five to ten years' time to work out what Intel needs to design into chips to run them: "we need to understand the future of software so we understand what hardware to build; for example do we need to add more cache memory?" Several of the projects he's interested in are about model-based computing. 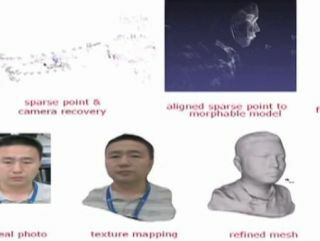 Sometimes that's actual models, as in the research Intel Labs in China is doing to create 3D objects from a series of digital photos; think Microsoft Photosynth running on your own PC, making 3D copies of real objects that you can use in virtual world. It needs 25-30 photographs from a standard digital camera, rather than special equipment and you don't need to position the camera precisely or give the software details of how far away the camera was from the object; the system calculates all that. Today it takes a trained 3D artist to make a good model; in the future Koehl suggests it's going to be as easy as writing a blog post. The same process could make a realistic avatar of your head that can keep changing expression by tracking your actual face through your webcam. The software combines the 3D model it generates from the photos with generic models of faces (automatically derived from scanning thousands of photos, so the system learns, for instance, that mouths move but noses don't). Models could also help you drive more safely, or even let your PC drive your car: Intel is working with Neustar in China on a Larrabee-based in-car system that could identify pedestrians and other cars on the road. "In the long term," hopes Koehl, "it could lead to automated cars that drive themselves safely – or at least pull over safely if you fall asleep at the wheel!"